This version of rice pudding uses brown rice to give it more heart-healthy fiber. The addition of bananas makes it a good source of potassium. Nutritious and delicious! Looking for a quicker option? 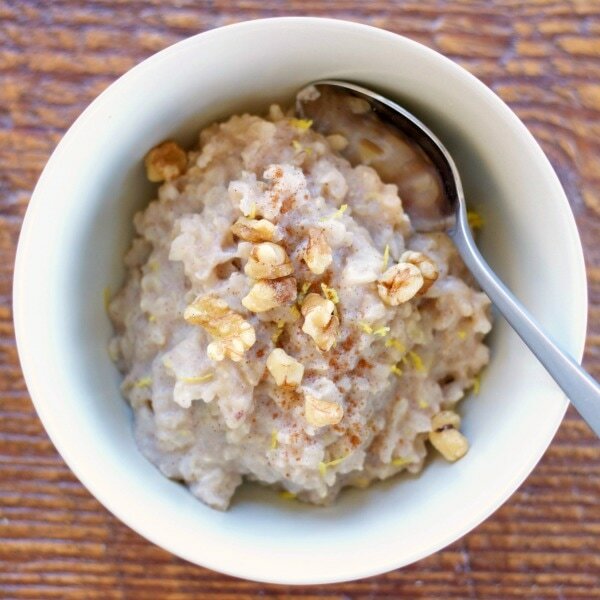 You might enjoy Healthier Rice Pudding. Optional Toppings: walnuts, raisins, fruit, etc. Add first 7 ingredients to slow cooker*, stir to combine, and cook on low for about 4-4½ hours. Stir in mashed bananas and lemon zest. Serve and sprinkle with cinnamon and desired toppings. Add rice, water, and salt to a large pot, stir to combine and bring to a boil over medium-high heat. Reduce heat to low, cover and simmer for about 45 minutes, or until water is absorbed. Add milk, brown sugar, and cinnamon. Bring back to a simmer and cook for about 10 minutes, until creamy. Turn off heat and stir in vanilla, lemon zest, and banana.